This entry was written by admin on March 18th, 2013. 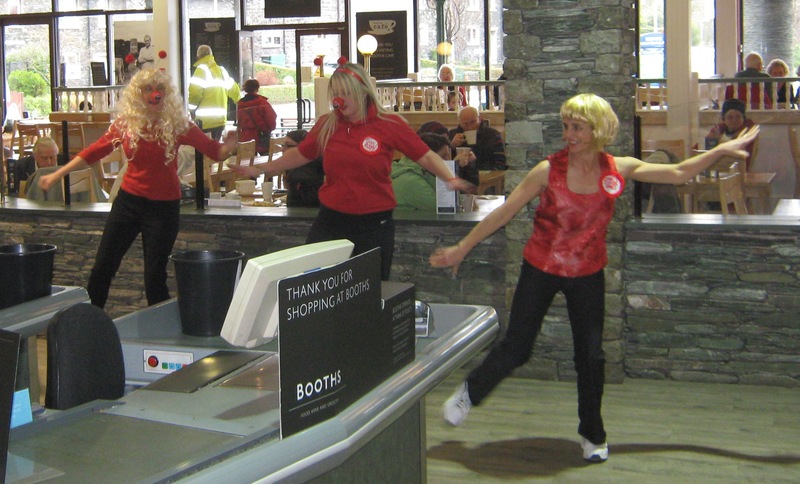 Members of the Blennerhasset Zumba class raised £1,300 for Comic Relief by carrying out four surprise performances in Booths and on Keswick High Street on Red Nose Day. Shoppers in Booths stopped what they were doing to gather round and watch the dance routine to the Comic Relief song, ‘One Way or Another’. The dancers, adorned with blond wigs, drew together in a line between the cafe and the checkouts as the music started and each joined in with the routine. The intrepid dancers then moved outside to perform another three times on the High Street. The group, known as Shirlz Zumba Babes, had all worked hard to practice the routine and to get sponsors prior to the event. At the end of each performance, people gave donations totalling almost £100 bringing their total, with sponsorship, to £1,300 for Comic Relief, which aims to transform the lives of poor and vulnerable people in the UK and across the world. The Zumba class is held regularly at Blennerhasset Village Hall on Mondays at 7.00pm. There is also a class at Braithwaite Memorial Hall on Tuesdays at 6.00pm and Bothel Village Hall on Thursdays at 7.00pm.